Watch Lucifer Season 3 Episode 17 online via TV Fanatic with over 1 options to watch the Lucifer S3E17 full episode. Affiliates with free and paid streaming include Amazon. 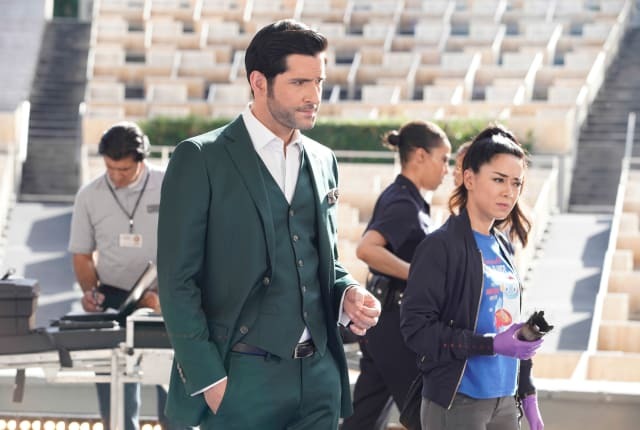 On Lucifer Season 3 Episode 17, the team is thrust into the world of big-ticket stadium shows and crazed fans, when a a superstar singer's life is threatened. Pinhead: Detective, if I hid under a rock every time there was an issue, I'd still be doing bat mitzvahs. Lucifer: Also, you'd be under a rock. Most unpleasant. Permalink: Also, you'd be under a rock. Most unpleasant. Pierce: It's just life, you know? It's like this eternal wasteland of meaningless existence. A dark void staring down at you like a beaten dog scrounging on the side of the road just waiting to get mowed down by the next tsunami of crap. Dan: Wow. Hmpf. Maybe we all are just dust in the wind. Permalink: Wow. Hmpf. Maybe we all are just dust in the wind. Lucifer Season 3 Episode 17 Review: Let Pinhead Sing!